We have had a busy weekend - things change perspective when I get Ian to package stuff - like the many kilos of Indian silk loom waste! Followed by the many kilos of cocoon strippings. Above are two tags - something I have started - wonder what they will be part of or what they are all about or even made of? Red stitching should be a clue. 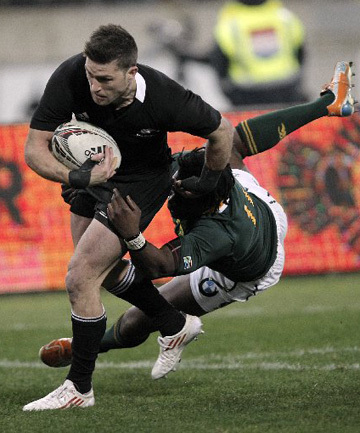 We really enjoyed the rugby last night - another good win to the All Blacks and it was wonderful to see Cory Jane playing so well. Roll on next Saturday but not until after the show has finished for the day. If you are planning to go to the show in Perth next weekend do pop over and leave me a comment on facebook - I shall give out the 5 names for the free tickets tomorrow. When you are busy it is still exciting to receive goodies like this from Rae and Jacinta. I am preparing for the show in Perth next week with a list quite a lot longer than the time available but I will do the best I can - it seems to have snuck up when I thought there was more time. Inside this lovely parcel was all our hand dyed lovelies - silk caps, soft cocoons, chiffon, gauze, loom ends, wool blanket, new threads (Madrid), and a lovely silk velvet skirt which Jacinta has dyed for me to use. We are having some glorious rain and had quite a bit of lightning and thunder as well. Off to try a new little French restaurant down the road tonight. Don't forget to pop over to the facebook page and leave me a comment - I have 5 free tickets to the show at Claremont starting next Friday. I will be drawing the names on Sunday. I am planning myself to do demos throughout the show playing with easy peasy silk paper, colour sprays, metallic flakes, the distressable fabrics (Lutradur, Evolon, Kunin Felt) and whatever else I feel like. Linda Baldock will be making magic throughout the show on our stand, the pick-a-pockets will be on display and there is an artists working studio nearby to us as well. Plus I need to get together The Thread Studio big door prize. Margaret Olley died today - very sad - I know she was 88 but I love her work - one of my favourite artists not only because her studio always makes me feel very comfortable because it looks like an artist's studio should. 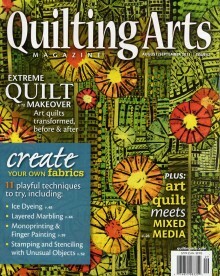 Busy as always today with Quilting Arts 52 arriving this afternoon - they will all be sent out tomorrow - I think there will be a few over if anyone extra wants one. The Textile Art Festival in Brisbane has been cancelled and will not be run in 2012 - I think it was inevitable - I know lots of people enjoyed it very much and we certainly enjoyed seeing so many of our friends and customers - you were all very good to us - but as I said at the time, there were many things we were unhappy about. I believe there is a place for such an event and I hope someone else takes up the gauntlet. 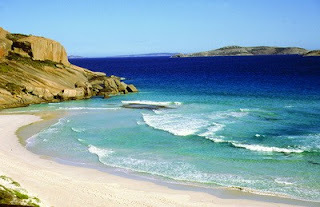 Here I am in Esperance out on my morning walk with - naturally - a pair of red shoes on. I could only take one pair because I needed the space in the suitcase for all my stuff. And of course when you are teaching you know that you wanted to show this and that but you can't and you wanted to use this and that but you can't - those things are back at home - always. I had a lovely class for two days and fabulous lunches on both days - all that country caring.... We played with gummy silk strippings and rods, Starburst Sprays, paper napkins, metallic flakes, Kunin felt, Lutradur, Evolon, water soluble paper, Tissutex, nappy liners and whatever else we could manage. Fabulous work they did and I am sorry that I don't know who owned what - it was a rush at the end as it always is. After class finished yesterday Julie took me for a drive around teh environs - I have only been to Esperance and that was a long time ago - we went to West Beach or beyond - I am not sure - and for a walk on the beach - the colour of the water was superb. Finally - you might think this is a sunset but in fact it was 8.30am and the sun was up. a little slide show using the versa tool letter stamps on the distressable fabrics and now I am off to Esperance and back on Monday - my workshop is titled An Artful Journey - aren''t they all? I have added a new short video on the Creative Versa Tool to facebook - do check it out and LIKE us - we like people liking us - ha ha. 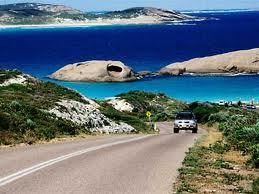 I shall add a new related slide show here tomorrow in between packing to go to Esperance for a weekend's teaching. Long long time since I was last in Esperance and it is over 2 hours flying time. Squeezing stuff into my bag is going to be the hardest hing. just to show my senneliers - not the iridescent or metallics and slightly less pristine. I love them because they work so easily and can be used for rubbings and moved around with the iron etc. Heather - with the curries the numbers have been pot luck - I bravely let Ian select a random number. Actually it is a good way to go - makes you try things. thought I would share my box of 25 yummy Sennelier iridescent sticks. They don't make the 25 set any more but you can still get a yummy 12 set which has most of the iridescents and the metallics and a black and white. Smaller and softer than Shiva stiks they are great for all sorts of paper stuff and I do in fact use them on fabric. I have been experimenting with them quite a bit lately - it's always lovely to find a friend you had forgotten. Last night I thought I would cook another curry from the 50 Indian Curries (see an early blog entry) and I let Ian choose a number once again - this time he went for number 43. This was indeed out of my comfort cooking zone - and Aubergine (eggplant) curry and it was actually really tasty so it always pays to try something new. thanks to Jacinta's suggestion I have been playing with hand dyed viscose velvet - many people will know that we emboss a lot on velvet but this was a new trial and I have been exploring a few others as well. No info yet to share but it has been rather exciting and something very new. The illumination stamp is on the left. Lovely day in Perth today - Ian shot the real video today but as he hasn't turned his computer on, he will edit it and I will load it to facebook tomorrow. It was an experiment to see what people thought of the idea and got a good response. I plan to load a number of videos to facebook - at this stage on the distressables and then they will appear on our website - just short informative (hopefully) videos which may help to create an understanding. And of course, on facebook, there will probably be a good deal or two as well. And I plan a slide show to match each one but that will be here. I have also posted the start of a little video on the Creative Versa Tool and Kunin felt on The Thread Studio facebook page - do pop over and leave a comment and of course Like Us! 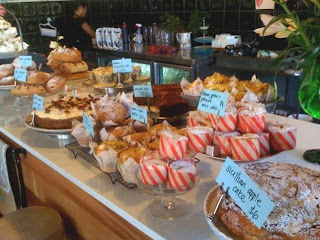 not to mention our cakes - I had a coconut one with the best lemon topping and Ian had rhubarb one. Shelagh was telling me she lives in the country surrounded by trees and parks and couldn't imagine living where there are 100s of people surrounding you. Well here we are not too far from the centre of Perth in our little oasis where I can hear the sounds of the birds chattering away most of the day along with the cars of course (and the stupid yappy dog in the apartment next door, locked away all day behind closed blinds). We do in fact have loads of people across the road, next door, behind us and everywhere but see all the trees and the truffa pillar out front. Not to mention the concrete coated bricks too heavy for us to move so becoming a little architectural. Another view - 4pm in the afternoon - the sun sets from the west - i.e. behind me photographing. and a third view - that is our right of way on the left as we have access at the back. Someone paid a lot of money for that access back in 1895. Looking to the studio with the sun starting to set. Somewhere there is my drawing chair - oh dear - better get to today's draw. And a slightly closer view. Now wouldn't you agree that this as as good as being miles away from the world in the country - we get the country feeling along with the craziness of a city. And we walk most places. And we have lots of parks all around us. City life is eclectic whenyou think about it and we were both small town kids once. fresh bay leaves from our bay leaf tree. 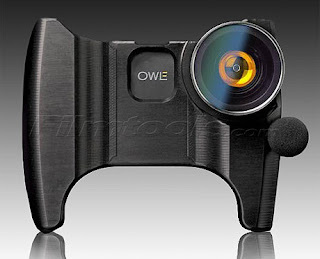 this is the OWLE I bought to use with my i-phone - it has a bigger lens so the pictures are a little clearer and a microphone for the little videos I have been making (not for publication yet). Next - my question for you - Jacinta, who loves to play with colour and dye, has been playing with all sorts of new and exciting combinations but while we remove colours from our big range from time to time, it is not our intention to add all of them because it becomes too much and anyway I suspect Jacinta would get bored. I don't dye but I love playing with colour too and putting things together. SO - we have an idea to offer a colour a month luxury pack which would only be available for that month - rather like a new monthly menu. It would be limited in numbers -and along with a variety of excitements would include colour inspiration and notes but it would not be a kit as such - i.e. you would not make a specific thing. We never work that way here anyway. I would love a response to our new excitement to see if others think it is a worthwhile thing. It would not be a club and you would never need to buy one each month but just to be inspired when one grabbed your attention. Each month it would change. Shelagh has something horrible for us to have to do in creativebrainedges tomorrow - I am going to hide under the table and be naughty. She does say it is a challenge and get with it. I got myself confused - thought it was today that the next holey moley started - saucy shoes - but it was actually the 5th - I think I got away with it because no one complained. Anyway 1st pdf all done now and time to bring out the beautiful Paris shoes. Been doing little drawings as well. The first iris is out and with my new OWLE for my i-phone I have been taking photos and little videos. it has a wide angle lens - I will become a photographer one day for sure! Lots of droppings from the eucalyptus trees and a covering everywhere like snow. It's really cold today - right into the bones - I turned the heating on in the studio very early - the concrete floor makes it cold so it has been lovely and warm. We love this time of the year when Le Tour de France is on - we get to admire the beautiful countryside in France. Back in 1992 when I had long service leave, we spent a lot of the time meandering around various parts of France staying in Gites and exploring the countryside. 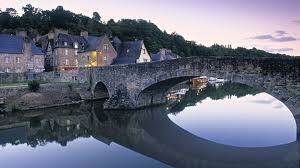 We spent a week in Bretagne and visited Dinan shown here. Watching the Tour last night was a real treat and they were cycling their way through wonderful countryside - we stayed not that far from St Malo. Loved it all. Shelagh and I working our little challenge on our creativebrainedges blog, have been amused that so many people have suddenly started up blogs with drawing and the like. As you will see, I am a lousy drawer who must only improve with practise which was half the point of our challenge to each other. The other half is when we do other things which we will be. I think Shelagh has given me a new freedom for Sunday but I need to get through Friday first. Today I didn't get the parcels I am waiting for apart from the balance of the Sheer heaven (great stuff that) but I did get these dear little stamps - all in their own special box. You have to pop the letters and numbers on yourself but aren't they gorgeous? I am a bit of a sucker for letter stamps and am still hunting for an interesting range of foam stamps - especially distressed looking ones. When you lift the lid they are all there for excitement - and use of course. Off to do my 5 minute drawing - never realised how fast 5 minutes takes to go by. Haven't got very far this week - have been busy workwise - people always want what you are out of and you have to package. All sorts of half of orders have arrived and I am waiting on lots of halves to appear. 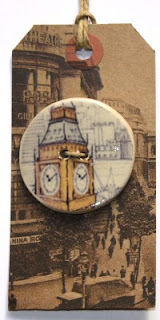 Very strange stuff and lots of parcels have not appeared as yet at all so I am sure the postie will have a heap tomorrow - lots of little things I am waiting for but I did get a box of more wonderful buttons to die for - just have to get Ian to hurry them onto the website. They are so gorgeous - a couple are Venice - love the one with the guards etc. 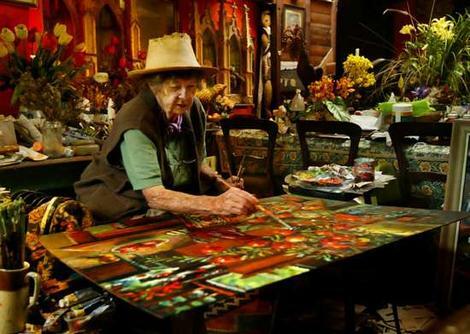 Very talented lady. A good find I reckon. 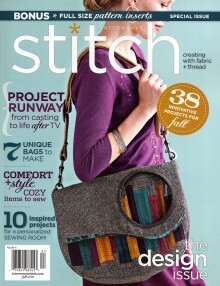 Stitch magazine arrived today - we have sent out all the requested ones and there are a few left over if anyone is interested. This magazine is really rather good - I wasn't impressed when it first appeared but this issue in particular has some great design stuff in it. And the balance of Down under Textiles appeared as well so we have sent them all out to their new homes now with a few left over. The newsletter has caused a bit of angst this round - for some unknown reason some people have not had a link to click on - please just email us and Ian will send you a real one. It isn't that I did anything different. I know plenty of people have received it though because we have sold out of one of the specials and the other is nearly done as well. Off to work on my magic sample books tonight but first to watch the tour de France and see how they are getting on. Tomorrow Shelagh and I have a new 5 minute draw to do on our creative brain edges blog.